Western jewelry often brings to mind images of sterling silver, turquoise and red coral. While these materials are still very much a part of western jewelry design, other materials are finding their place as well. Materials such as wood, horse shoe nails and precious metals like gold and platinum now play an important role in the genre. Western & Southwestern jewelry now reaches beyond classic to contemporary perspectives. From turquoise and “old pawn” to iconic forms, chunky to delicate pieces western jewelry, now embraces them all. Jewelry in western style is as much a part of western fashion as cowboy boots. Western Jewelry is very popular in the country side in the states of Texas, Arizona and Nevada. You can find some great examples of Western Jewelry if you do a Google search or search on Amazon or even on Ebay. Prices usually range in the $5 to $25 range and are very affordable. 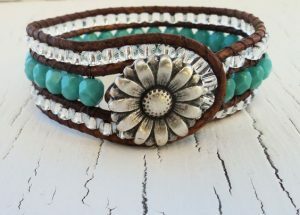 It’s definitely a very affordable style and even you can create your own Western Jewelry if you have some time and consider yourself a little artistic.